American Retail Supply has more than 60 colors of gift tissue paper that you can match most any type or theme of gift wrapping and packaging. Our colored tissue paper is eco-friendly and contains min. 10% post consumer recycled content. Some of most popular colored tissue papers are dark pink, evergreen, ivory, holiday green, French vanilla, parade blue, aloe green, turquoise colored tissue paper, buttercup, citrus green, cerise, apricot, scarlet tissue paper and purple tissue paper. Gift Wrap Color tissue paper can also be used for craft projects like tissue paper flowers or creating pinatas. 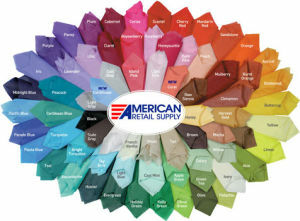 You can buy the color tissue paper from American Retail Supply at great wholesale prices. Gift Wrap Color Tissue Paper can be customized with your brand logo, store logo or name. You can print the name or logo scattered all over the tissue or centered on the tissue sheet. If you already have design and vector files for the custom tissue paper, our experts can help you put the package for you needs or can help you design the look and feel of custom tissue paper for your store. You can also use combination of contrasting color tissue paper for making your gift packaging stand out such as using black and white, red and yellow or apricot, purple and light blue, holiday red and green and so on. Our colored gift wrap tissue paper is one of the best and highest quality tissue paper made in USA and eco-friendly manufacturing environment. The look, feel and touch of our tissue paper is equal or superior to any equivalent tissue paper in the market. Wide array of retail stores such as apparel stores, gift shops, jewelry stores, sporting goods rely on American Retail for their gift wrapping packaging needs and store fixture needs. You can order colored tissue paper by the package. Package sizes are one ream of 480 sheets, and sheets are 20" x 30". Colors represented may vary slightly due to different computer screens. Even if you don’t find the color on our site that perfectly matches your need, our sales representative are happy to help you. Call American Retail Supply if you have any questions or need assistance in placing an order 1-800-426-5708.